A March 25, 2014 NRC press release* announced that Chairman Macfarlane presented the Sixth National Report for the Convention on Nuclear Safety** to International Atomic Energy Agency (IAEA) member countries. The report mentions safety culture (SC) several times, as discussed below. There is no breaking news in a report like this. We’re posting about it only because it provides an encyclopedic review of NRC activities including a description of how SC fits into their grand scheme of things. We also tie the report’s contents to related posts on Safetymatters. The numbers shown below are section numbers in the report. This section describes how the NRC engages with stakeholders and the broader public. As part of such engagement, the NRC says it expects employers to maintain an open environment where workers are free to raise safety concerns. “These expectations are communicated through the NRC’s Safety Culture Policy Statement” and other regulatory directives and tools. (p. 72) This is pretty straightforward and we have no comment. Section 8 describes the NRC, from its position in the federal government to how it runs its internal activities. One such activity is the NRC Inspector General’s triennial General Safety Culture and Climate Survey for NRC employees. Reporting on the most recent (2012) survey, “the NRC scored above both Federal and private sector benchmarks, although in 2012 the agency did not perform as strongly as it had in the past.” (p. 96) We posted on the internal SC survey back on April 6, 2013; we felt the survey raised a few significant issues. Section 10 covers activities that ensure that safety receives its “due priority” from licensees and the NRC itself. Sub-section 10.4 provides an in-depth description of the NRC’s SC-related policies and practices so we excerpt from it at length. The discussion begins with the SC policy statement and the traits of a positive (sic) SC, including Leadership, Problem identification and resolution, Personal accountability, etc. “In the routine or baseline inspection program, the inspector will develop an inspection finding and then identify whether an aspect of a safety culture component is a significant causal factor of the finding. The NRC communicates the inspection findings to the licensee along with the associated safety culture aspect. We described this hierarchy of NRC SC-related activities in a post on May 24, 2013. We called it de facto regulation of SC. Reading the above only confirms that conclusion. When the NRC asks, requests or expects the licensee to do something, it’s akin to a military commander’s “wishes,” i.e., they’re the same as orders. This section covers the NRC’s actions to strengthen its internal SC. This actions include appointing an SC Program Manager; integrating SC into the NRC’s Strategic Plan; developing training; evaluating the NRC’s problem identification, evaluation and resolution processes; and establishing clear expectations and accountability for maintaining current policies and procedures. We would ask how SC affects (and is affected by) the NRC’s decision making and resource allocation processes, work practices, operating experience integration and establishing personal accountability for maintaining the agency’s SC. What’s good for the goose (licensee) is good for the gander (regulator). INPO also provided content for the report. Interestingly, it is a 39-page Part 3 in the body of the report, not an appendix. Part 3 covers INPO’s mission, organization, etc. and includes a section on SC. This 341 page report appears to cover every aspect of the NRC’s operations but, as noted in our introduction, it does not present any new information. It’s a good reference document to cite if someone asks you what the NRC is or what it does. Of course, both definitions are different from the INPO definition provided above. We’ll leave it as an exercise for the reader to figure out what this means. * NRC Press Release No: 14-021, “NRC Chairman Macfarlane Presents U.S. National Report to IAEA’s Convention on Nuclear Safety” (Mar. 25, 2014). ADAMS ML14084A303. ** NRC NUREG-1650 Rev. 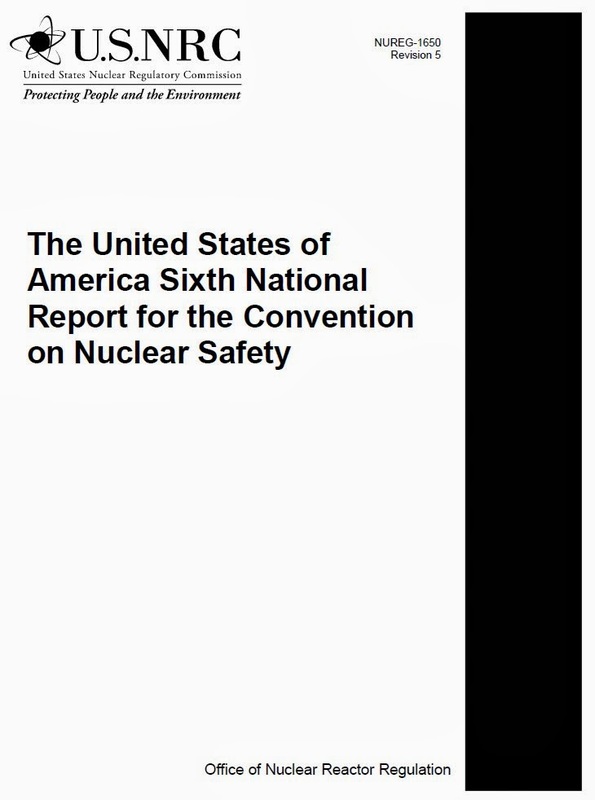 5, “The United States of America Sixth National Report for the Convention on Nuclear Safety” (Oct. 2013). ADAMS ML13303B021. *** NUREG/BR 0500 Rev 1, “Safety Culture Policy Statement” (Dec 2012). ADAMS ML12355A122. This definition comports with the one published in the Federal Register Vol. 76, No. 114 (June 14, 2011) p. 34777. What is significant however, is that the official US definition is now definitely at odds with that adopted by INSAG and common to all the IAEA guidance documents. The differences is whether the topic of interest for "safety culture purposes" is institutional Issues Management (INSAG) or behaviors and attitudes of all individuals - from top to bottom in the organization - toward nuclear safety. If the normative meanings of culture (i.e. outside the nuclear world) were applicable, this distinction would be conspicuous and large. Alas, the indications from the blogosphere would seem to leave room for NSC to be just about any hobby horse the commenter wishes to ride. That is not the makings of a "Rising standard of Adequacy" for protection assurance.